INFO.MAIL – Consists exclusively of advertising, marketing, promotional materials or periodicals and contains the same message except the name of the addressee, the address and the identification number. 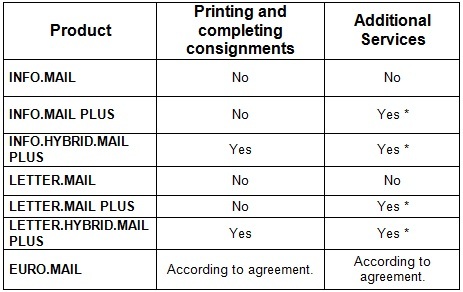 LETTER.MAIL – Is a correspondence (bill, invoice, financial statement or other non-identical content and form that relates to obligations or other relationships between the sender and the addressee) and / or any other written notice in any form of physical medium to be delivered to on it or on the envelope. EURO.MAIL – Is correspondence and / or other written notification in any form of physical medium to be delivered to the address outside of the Slovakia which is stated on it or on the envelope. Value-added services are services provided to increase the speed and reliability of the collection and distribution of consignments to its user (sender or consignee). Advertising, promotional, marketing materials, direct mails, catalogs, or samples. Within one distribution, the content must be the same, except for its name, address, and identification number. Correspondence (statements, invoices or other non-identical content) or any other written communication on any kind of physical medium. Based on the agreement and conditions of the recipient's country. KOLOS has been delivering postal consignments since 2008, following the liberalization of the Slovak postal market from January 1, 2012, including consignments weighing below 50 grams. We optimize the cost of your postal services by combining production, price, quality and always the up to date database. We provide our customers quality added-value postal services: Within addressed delivery, we cover over 94% of Slovak households in 96% of the territory, which represents 1,811,000 households of the total number of 1,938,000 registered households. We are leaders in market thanks to our technological innovations by using the track & trace (tracking consignment delivery) which provides information about delivery even on regular mail deliveries within our network. The added value of our addressed delivery products is that we review each claim within 48 hours, we process and electronically send a file containing reasons for non-delivery of consignments that could not be delivered to the addressee. The resulting summary report of delivery and quality is processed after each distribution. We send it electronically, or it's located in the private area - all the information, statistics, maps and results of the inspections are in one place.